Statewide virtual public school’s survey also indicates why families choose online education. Washington Connections Academy, a tuition-free online public school serving students in grades K-10 across Washington for the upcoming 2017-18 school year, recently announced the results of the school’s first-ever parent satisfaction survey. Conducted January-March 2017, the survey found that 90 percent of parents with currently enrolled students would recommend Washington Connections Academy to parents whose children are not enrolled in the program. Washington Connections Academy will begin serving students for its second year on Aug. 28, adding grades nine and ten. 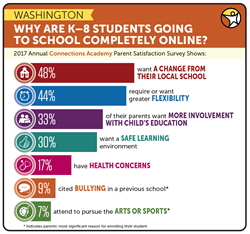 In addition to asking parents about their satisfaction with Washington Connections Academy, the survey asked families their reasons for choosing an online school for their children. Parents cited wanting a change from their local school as the primary reason they enrolled (48 percent), while 44 percent required or wanted greater flexibility in their child’s education. Other top reasons included parents wanting more involvement with their child’s education (33 percent) and 30 percent said they wanted a safe learning environment. Health concerns (17 percent), bullying in a previous school (9 percent) and participation in the arts or sports (7 percent) also contributed to parents’ decisions to enroll in online school. Washington Connections Academy operates in partnership with the Mary M. Knight school district to provide high-quality, personalized online education to students statewide. The school combines Washington-certified teachers with a curriculum that meets rigorous state education standards. Teachers work closely with students to create an individualized learning plan that leverages their personal strengths to ensure success. For families interested in learning about the program, the school is hosting online and in-person information sessions. These events offer parents an opportunity to ask questions and learn more about the school’s curriculum. The full schedule of information sessions can be found online: http://www.WashingtonConnectionsAcademy.com/events. To learn more about the school, visit http://www.WashingtonConnectionsAcademy.com. Washington Connections Academy is a tuition-free, high-quality, highly accountable virtual public school serving students in grades K-12 throughout Washington. Washington Connections Academy (WACA) is operated in partnership with the Mary M. Knight school district. All WACA services are offered by the Mary M. Knight school district under contract with Connections Academy. Opening in fall 2016, Washington Connections Academy currently serves students in grades K-10. Grades eleven and twelve will be added in subsequent years. Washington Connections Academy provides students with the flexibility to learn from anywhere with a high-quality curriculum that meets rigorous state education standards. The combination of state-credentialed teachers, a proven curriculum, unique electives, technology tools and community experiences creates a supportive and successful online learning opportunity for families and children who want an individualized approach to education. For more information, call 800-382-6010 or visit http://www.WashingtonConnectionsAcademy.com.